Want to make your 96-04 Mustang stand out from the crowd? Look no further. The FlameThrower Sequential Turn Signal System is a true Plug-N-Play replacement harness for your Mustang Brake and Tail Light System. (NOTE: NOT FOR AMBER TAIL LIGHT SYSTEMS). (Make sure that your red lens assembly (NOT included) has the same (four) sockets as in the photo above. '94-'95 Mustangs use a different lamp socket set. 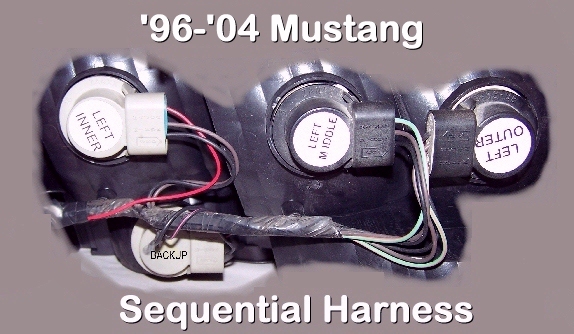 You can fit new '96-'04 lens assemblies (NOT included) to your '94-'95 Mustang in order to use this FlameThrower Sequential Brake and Tail Light Harness. Message us if you have a question.) You'll get one Pair of Rear Brake and Tail Light Sequential Signal Harnesses (complete with Electronic Sequencers) and Installation Manual. Save time by NOT having to wire or splice anything to install harnesses. · Assembled in the USA from latest technology electronic components · Nothing extra to buy! · Plug & Go simplicity · The entire installation can be completed with just a small wrench! · No Wire Cutting, No Splicing! The fully illustrated Installation Manual shows you step by step how to remove your existing rear lens (4 nuts), replace your old harness with the new Sequencer harness (one connector), and reinstall your lens - 10 minute changeover. The installation is completely reversible if you ever want to move your harness to another car! (Remember to save your old harnesses!) See the example, above, of a 2000 Mustang with standard thermal flasher - be sure to give the video a chance to completely load so it runs at real time (fast). This system will work well with your existing OEM thermal flasher. If you find that you would like your flasher to cycle a little slower, please replace your existing OEM thermal flasher with one of our FlameThrower True Electronic Flashers. It is entirely up to you - some like the swift sweeping display, some like a little more pronounced blink. (Your flasher is located just above the driver side right kneecap, behind the dash panel, clipped to the firewall, frame support or transmission tunnel. It slides out of the metal mounting clip, then disconnects from the connector.) So, if you like the mixing of the Old with the New, then don't wait. Buy the FlameThrower Sequential Turn Signal System, now. Don’t waste your money on inferior imitations. Buy the best! Since 1984. So, let's get this show on the road - Hit the BUY IT NOW button and pay your Paypal invoice, and we'll ship right away. As a Special Deal, if you send me YOUR Brake/Tail Light Harnesses for retrofitting, I will REFUND you $20, and return your modified Sequential Harnesses within 3 business days. Don't send your harnesses to me until after you have been notified that you have won the auction. I will send you an Ebay Message with the shipping address to send your left and right harness set. Harnesses may, or may not include new bulbs. it depends entirely on what's in stock when you order. $124.95, including shipping and Slow Cycle Flasher. $99.95 including shipping WITHOUT Flasher.